When my husband and I bought our two bedroom row house in the Del Ray area we were pregnant with our first son. We assumed we would stay in the house for three years max and then move to a bigger house when we decided to have a second baby. Well, we fell in love with the neighborhood and our house and then we got pregnant with boy #2. 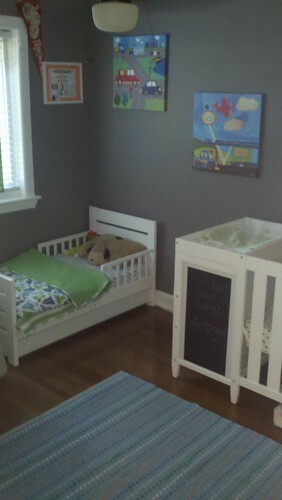 When we made the final decision to stay for a while longer, we realized we were really going to have to use our creative juices to make our house work for our growing family, most importantly, how to make the small second bedroom work for two boys. After months and months of researching and planning we did it! Below are pictures of the finished product. I’m pretty proud of how we made this work. 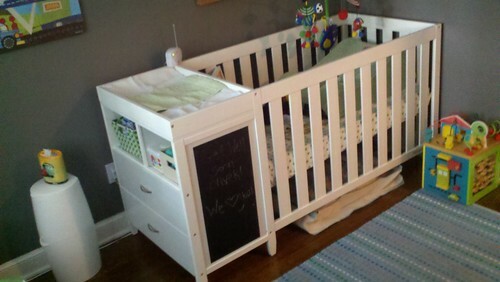 Notice the crib with the attached changing table that also has two deep drawers below it as well as two cubbies? Also the toddler bed has two storage drawers that run the width of the bed. 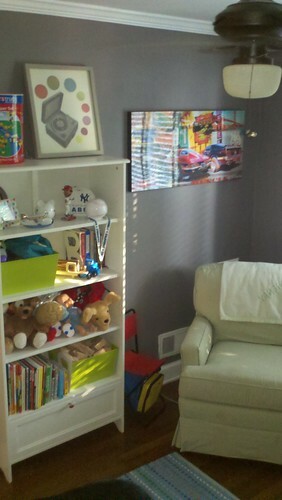 The best surprise was, with the new layout and new furniture we were able to fit a book-case into the room which serves as the book and toy corner. 1) Dark colors can definitely make a small room look BIGGER when paired with light furniture. I used a dark gray which really made the white furniture pop. 3) We splurged on crown molding in the boys’ room and I think it made a world of difference and opened up the room even more. 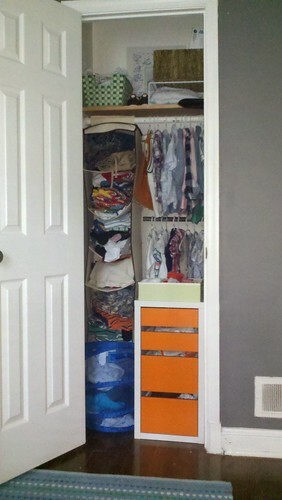 If that’s a small room then my child must live in a closet. Haha, we know the feeling! This bedroom is about 8×10. Sara did a great job maximizing the space.